Getting corset making inspiration can sometimes be difficult, especially when you’re new to Corsetry, but even experienced corset makers can sometimes get a bit stuck. But ideas for fabrics, colors, decoration and even corset pattern designs can come from anywhere. I went to Chelsea Flower Show recently with my mother (yes I know, very British of us!). We go every year for her birthday. This year I wanted to soak up the flowery scenery so I could draw you some inspirational corset designs. 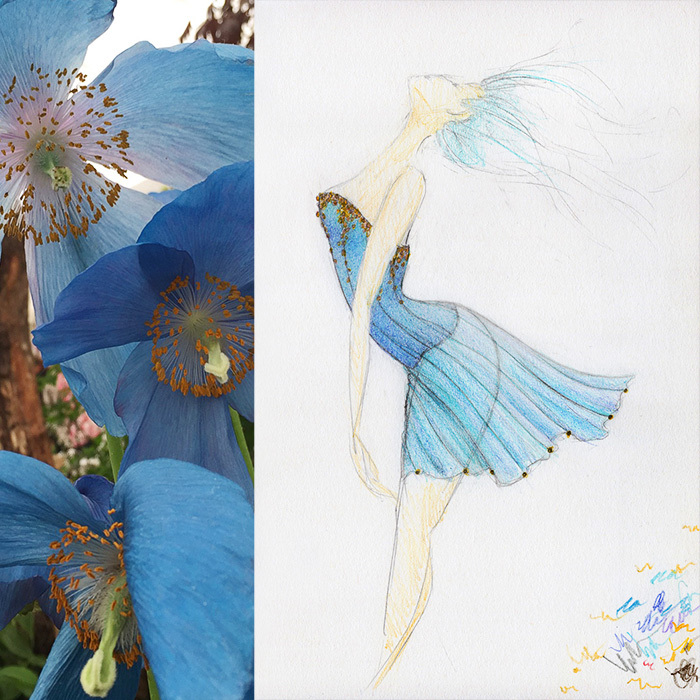 It’s much easier to show you how to find inspiration than to explain it to you, so I’ve drawn the below sketches and included the flowers they’re based on. I hope these corset designs will both inspire and help you to see how you can find creative influences around you. Inspiration hunting can get addictive – you have been warned. Make the effort to look for inspiration and after a while things start jumping out at you. For example, have you ever decided you wanted a car / baby / puppy? Then suddenly you start seeing the object of your desires everywhere? When I’m shopping, I take pics of clothes, window designs, colors and textures. I even take sneaky snaps of stuff in books, but I’ve never found inspiration before from visiting a flower show, so to prove to you that you can literally find inspiration in anything, I went looking for it at Chelsea Flower Show. Here’s my second flower inspired pic. Clothes are never camera shy. Neither are books, bags, cars, shop displays, posters, mannequins, paintings or cuddly toys; all of which can be great sources of inspiration when you’re stuck for corset making ideas. Everything’s a potential corset idea, from the color of a lipstick to the buckle on the bag of the guy in front of you on the escalator, so get out that wonder of technology in your pocket, the one none of us can bare to part with 24/7 – no, the camera phone not the credit card – and get snapping! I liked the top-stitched sections above the knee on these green trousers. They’re a nice shape and with a contrasting fabric behind them, would look great on a corset. This is a jumper I tried on in a shop. The fabric has been brushed with metallic paint. I could do that with some black textured fabric or some corded fabric even! 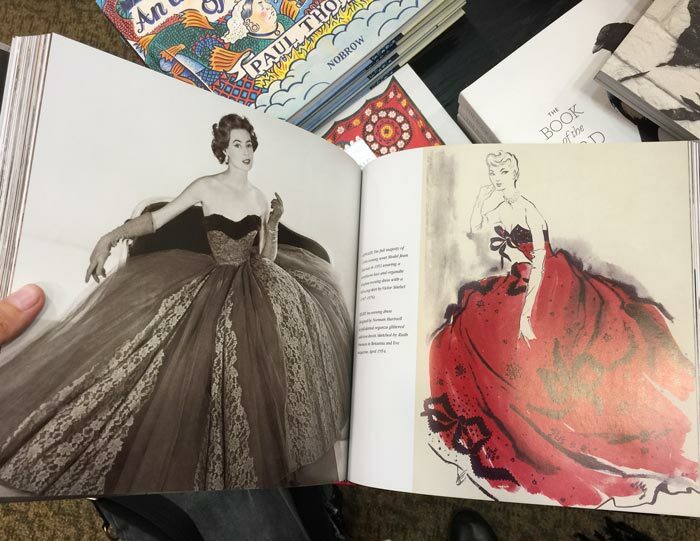 Here’s two dresses in a fashion book I was browsing. They both have detailing along the top edges that would look great on a corset. Another great corset-able dress design but in a painting. This lady’s stockings were epic! (I will be looking for some on eBay). This was also taken to serve as a reminder that I must get some Alexander Henry ‘tattoo’ fabric to revisit the tattoo corset idea. This Bombshells comic had some awesome corset designs on the front. I collect comics with cool outfits and costumes in for inspiration. So there you have it, inspiration can be found anywhere, you just need to look for it! And if you want the skills to create your own corsets but don’t know where to start learning the amazing art of corsetry then why not check out my easy to follow Corset Making Video Course for a stress free way to learn!